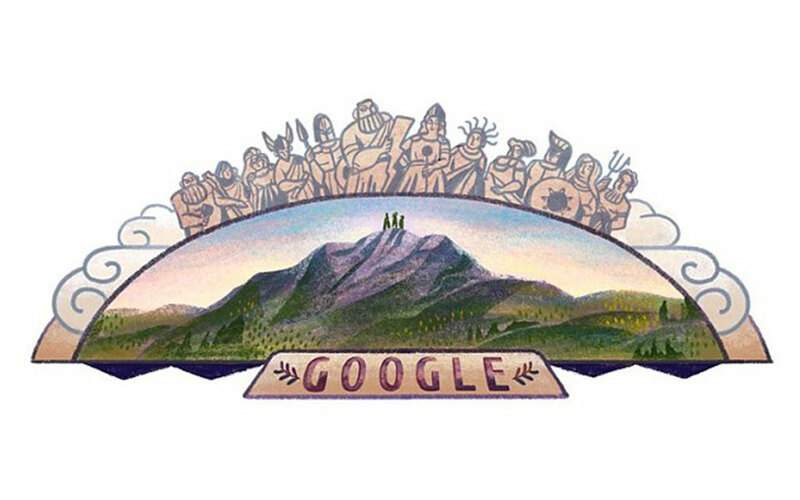 Google celebrates the 105th anniversary of the first recorded ascent of Mount Olympus. It was 105 years ago today that Daniel Baud-Bovy, Frederic Boissonnas and Christos Kakalos became the first three modern-day climbers to reach Mytikas, the highest peak of Olympus, 2.918 meters above the sea. Celebrating the anniversary, Google’s Doodle of the day (the illustrations that appear on the search engine’s homepage) shows three human silhouettes standing on top of a mountain peak. Depicted among the clouds above them are the twelve gods of Olympus. While many amateur climbers choose to hike or climb the mountain today, aiming either for its highest peak or one of the easier targets (even beginners can make the most popular trek, from Litochoro to Prionia), in 1913, no one knew what to expect at the top. Baud-Bovy and Boissonnas were Swiss climbers, carrying with them heavy photo equipment in order to document the climb. Kakalos was their guide. A hunter with lots of experience hiking in this terrain, rumor has it that he climbed some of the roughest parts of the ascent barefoot. As no one knew the way, and storm clouds blocked their view of the mountain, they first reached another, lower peak, by mistake, before making it to the top of Mytikas. Kakalos later became a mountain guide, and made the ascent to the peak many times. One of the mountain’s highest refuges, located on the Plateau of Muses at an elevation of 2650 meters, is named after him. Mount Olympus has 52 peaks. The highest peak is Mytikas, also called the Pantheon. This was the legendary abode of the 12 Olympian gods. The Stefani peak, known as the Throne of Zeus, from where he would hurl his lightning bolts, is steeper but a little lower. Mount Olympus was the first area of Greece to be listed for protection as a national forest, in 1938. Most climbers make the ascent in the warmer months, as the conditions are far more challenging and dangerous in the winter.